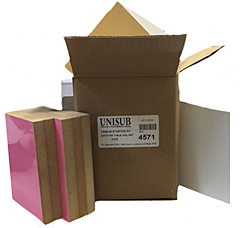 Contains 40 pieces of assorted (6"x6") .090" FRP (Fiber Reinforced Plastic), 5/8" MDF (Medium Density Fiberboard) Natural Wood Hardboard, .030 White Gloss and Gold Gloss Aluminum and 1/8" THB, (factory selected and may vary). Use these pieces to demonstrate photo or color effects on each type finish. Includes assorted aluminum pieces: White Gloss, Semi-Gloss White, White Matte, Clear Gloss and Clear Matte finishes (factory selected and may vary). 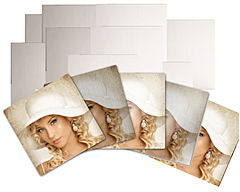 Use these pieces to demonstrate photo or color effects on each type finish.